The monument on the hill above was erected by the Great Northern Railway in 1925 to commemorate the farthest point north reached by the Lewis and Clark Expedition, 1804-06. Captain Meriwether Lewis, with three of his best men, left the main party at the Missouri River and embarked on a side trip to explore the headwaters of the Marias River. He hoped to be able to report to President Jefferson that the headwaters arose north of the 49th parallel, thus extending the boundaries of the newly acquired Louisiana Purchase. The party camped on the Cut Bank River July 22-25, 1806, in a “beautiful and extensive bottom. 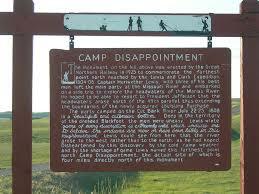 “ Deep in the territory of the dreaded Blackfeet, the men were uneasy. Lewis wrote, “gam[e] of every description is extremely wild which induces me to believe that the Indians are now, or have been lately in this neighborhood” Lewis could see from here that the river rose to the west rather than to the north, as he had hoped. 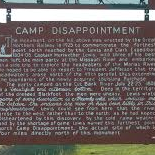 Disheartened by this discovery, by the cold, rainy weather, and by the shortage of game, Lewis named this farthest point north Camp Disappointment, the actual site of which is four miles directly north of this monument.